Where abundant lush grass demanded to be mowed on a weekly basis there are now large patches of brown as lawns have succumbed to the heatwave. 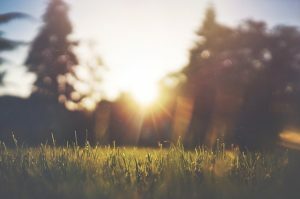 Eco–conscious householders will often choose not to water the lawn in favour of conserving this precious resource – and let’s not forget how the presence of a water meter can influence that choice. The result is carefully manicured lawns that, let’s be blunt, appear to have died. Can I save my lawn? So what is the outlook for lawns that are now residing quite firmly on the yellow/ brown colour spectrum? The good news is that with a bit of tender loving care things should be right as rain once the dry spell comes to an end. Grass is fast growing and, rather than dying out, patches of grass may actually just be dormant. To give your garden a helping hand in the recovery process you will need to rake away any debris, aerate the soil a little and spread some grass seed on sparse spots. From there on the autumn weather will allow the lawn to recover in time for spring. However, if a dry spell is particularly prolonged and becomes a drought there is a chance that the lawn may actually die and need to be entirely reseeded or replaced. What can I do to protect my lawn in dry weather? If there is no hosepipe ban in place you can choose to water the lawn sparsely to keep moisture topped up. Adding too much water at one time is pointless as it will run off but could also encourage moss. Leave grass longer when it is cut. This is a good tip for strengthening the condition of a lawn generally, but comes into play in hot, dry weather as it helps to protect the grass. Establish a good lawn care routine throughout the year so that it remains robust and better prepared for difficult weather conditions. For more help caring for your lawn get in touch with Garden Busters.